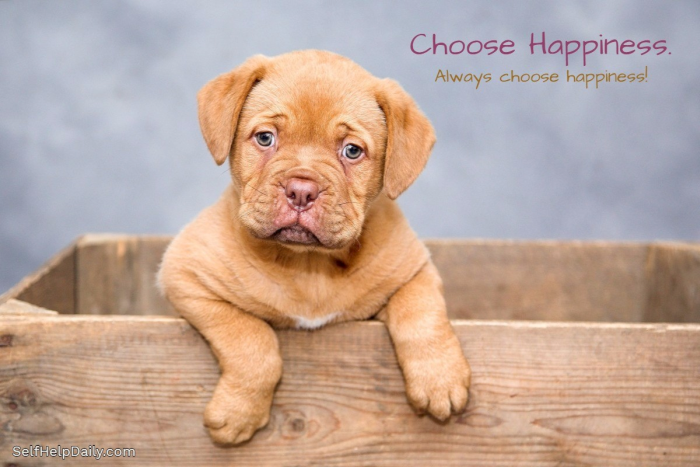 When You’re Feeling Sad, Your First Move is to CHOOSE Happiness! How to feel happy when you’re sad. How to cope with depression. How to cope with sadness. So many people with so many feelings – feelings that aren’t measuring up to what they want, or need, them to be. I’d be lying if I said it didn’t kind of break my heart that so many people are so desperate to feel happier that they turn to search engines. I wish I could pop into each one’s world, with two Raspberry Smoothies in hand (one for me and one for them) and try to lift their spirits. If you, ironically, have landed among these words through a search engine via words like the ones above – I can’t share my raspberry smoothie with you right now but I hope I can help, if only just a little. It won’t be for a lack of trying. There are times in life when we’re going to feel down just as there are times in life when we’re going to feel downright giddy. We all “get that,” of course, but when we’re in the lower ranks of emotions, it’s not a lot of comfort. Before you continue your pursuit of happiness, ask yourself a few questions. Has something, in particular happened that has made me sad? If this is the case, cut yourself some slack. Your a flesh and blood human being and, as a result, have emotions. When something is painful, we feel pain. When something hurts our feelings, it leaves a bruise on our psyche. It’s natural. As with physical injuries, emotional injuries take time to heal. Give it time. Have I been getting enough sleep? A lack of sleep makes us prone to be overcome by emotions much more easily than we are when we’re fully rested. What you’re feeling right now could probably be alleviated GREATLY by a glorious nap. Accessing the situation should always be your first step in dealing with the blues. Once you have a pretty good idea what the REASON is, you can move on to making yourself feel better. What makes me feel better may be exactly what makes you feel better – then again, what floats my boat may sink your’s! Read through the list of “Pick Me Up“s below and find the ones that resonate with you. It may take one, it may take three, and – if your emotions really and truly have the upper hand today! – it may take 10. Contact “THAT” Person. We all have at least one person in our life who just seems to make the day brighter. Their outlook is almost always positive, they laugh easily and freely, and they seem to have a gift for taking negative vibes and spinning them into something positively beautiful. If at all possible, invite this person out to lunch or over for coffee. Spending time with them may be just what you need. Emotions and “vibes” are contagious, after all. Keeping that in mind, avoid the “Negative Nancies” until you’re in a better place. The last thing you need in your vulnerable position is someone bringing you further down! Spend Time with a Cat or Dog. In a similar vein to the above, spending time with a pet can do wonders for your mood. Carve an Hour Out of Your Day and Engage in Your Favorite Hobby. If you love reading, read for an entire hour (bliss!). If you love photography, take your camera and have at it. Do what you love for a whole hour and, after it’s over, take another if you can. Spend Some Time Outside. For whatever reasons, many times simply going outdoors can lift your mood. Take a walk, sit and listen to the birds, do a little yard work.. just enjoy the great outdoors. Be Active. Physical activity often lifts your mood and chases emotional clouds away. Accomplish Something. There is something incredibly satisfying about accomplishing something, whether it’s cleaning the refrigerator, washing your car, writing a blog post, straightening your closet, or catching up on laundry. Simply getting something done and sitting back and looking at it is a great feeling. The last time I had a little case of the blues (thanks Benadryl), I washed my vehicle and cleaned the inside as well. The combination of time spent outdoors, physical activity, and having something accomplished all worked together like magic. Treat Yourself. This one is pretty fun, if you ask me. Whatever your idea of a “special treat” is, treat yourself! Sundae, smoothie, new book, makeup, golf towel, pink top, blue top, lunch at Olive Garden… buy yourself something deliciously unnecessary and love every second. Talk to Someone if You Think It’d Help. Maybe it comes from being an only child, but I’ve never been one for “talking it out” when it comes to my feelings. I tend to sort them out on my own, if you will. However, it seems that the majority of humans love to talk it out with someone. Can I suggest that you at least do in face to face with someone you trust and not take it to social media? Please… I’m begging, here. Harness Your Thoughts. One of my favorite verses in the Bible is perfect for times when you feel low. Why? It reminds us where to corral our thoughts – “Finally, brothers and sisters, whatever is true, whatever is noble, whatever is right, whatever is pure, whatever is lovely, whatever is admirable–if anything is excellent or praiseworthy–think about such things.” (Philippians 4:8 NIV) This beautiful verse could probably cure more emotional ills than Dr. Phil could name. Point your thoughts in the right direction and watch everything else follow. When you have a terrible cold, what do you do? Sit around and lament the runny nose, curse the aches, and vow that you’ll never feel better again? Of course not. You know that it most certainly will pass and that your happily ever after has not been compromised. The same is true when your emotions have a “terrible cold” – this will pass and you’ll be yourself in no time. While “down,” do as you would when nursing a cold. Take extra good care of yourself, get more rest than normal, eat right, and hug your cat (or dog) often.